The story begins at Emma Lake, Saskatchewan, site of writer Allan Casey’s family cabin, built by his parents in 1960 for $2,500. From there, we embark on a journey through ten of Canada’s seldom-celebrated but beautiful and increasingly fragile lakes in this extraordinary piece of writing celebrating one of Canada’s iconic natural features. More than 60 percent of the world’s five million lakes are crammed into this one northern country. Endless pure lakes are the defining and unifying symbol of the Canadian landscape, making us the envy of a thirsty world. In Lakeland Casey, an award-winning journalist, takes us on a journey of these lakes, from log cabins to lakeside mansions, from the semi-desert of Okanagan Lake to the ponds of western Newfoundland, and over the language barrier to Lac Saint-Jean, Quebec. Across the sprawling, hard-to-define land called Canada, the language of lakes is spoken. Lakeland, suggests Casey, is a place, a state of mind, and perhaps even a new synonym for Canada. Despite problems of overdevelopment, these lakes remain the heartland of this country, and the place where our relationship with wilderness itself begins. Allan Casey is a journalist and author who writes about lakes and water issues. His book Lakeland: Ballad of a Freshwater Country, won the 2010 Governor General’s Award for non-fiction. 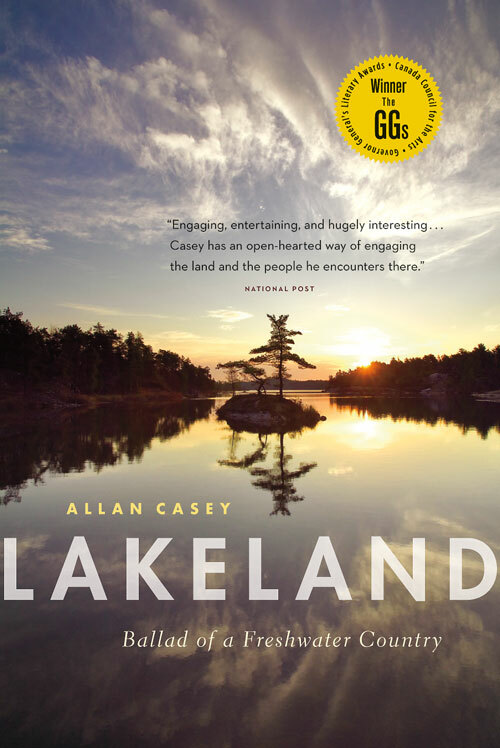 A mix of ecology, travel, memoir and natural history, Lakeland explores the role of lakes in the lives of Canadians, whose country is home to over sixty percent of the world’s lakes. His environmental reporting on water has earned many awards, including a 2011 National Magazine Award for a story on the future of the South Saskatchewan River. He received the inaugural Science Journalism Award from the University of British Columbia Graduate School of Journalism for a story about the challenges facing Lake Winnipeg. A regular contributor to Canadian Geographic magazine, he has received expedition research grant support from the Royal Canadian Geographical Society. When he is not writing about lakes and rivers, he is out on the water. Allan is a boat builder, life-long paddler and lake sailor. He lives in Saskatoon, and feels most at home in the lake country of Northern Saskatchewan. Click here to view Allan’s acceptance and greeting from the OBOC launch in 2012.